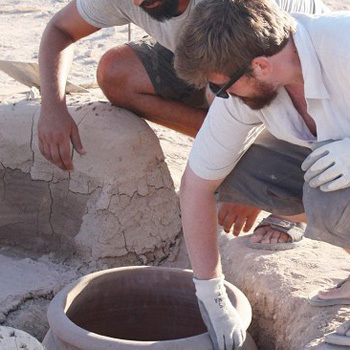 Archaeologists working in western Cyprus have uncovered a Bronze Age “microbrewery”. The team excavated a mud-plaster domed structure, which it says was used as a kiln to dry malt and make beer 3,500 years ago. The discovery also included “juglets”, which the team thinks would have been used to help created beers of different flavours. The excavation is taking place at the Early-Middle Bronze Age settlement of Kissonerga-Skalia, near Paphos. Dr Lindy Crewe, from the University of Manchester who has led the excavation since 2007, said: “Archaeologists believe beer drinking was an important part of society from the Neolithic onwards and may have even been the main reason that people began to cultivate grain in the first place. The team also found grinding tools and mortars which may have been used to break down the grain after it was malted, a small hearth and cooking pots made of clay to cook the beer gently. Dr Crewe added: “Beer was commonly drunk because it is more nutritious than bread and less likely to contain harmful pathogens than drinking water which can make you ill.
“Archaeologists …have uncovered a Bronze Age microbrewery”. Ha. Fair point. Now finding an industrial scale brewery from the Bronze Age … that would be a different piece of alco-news.